The holiday food frenzy is drawing to a close and I’m already psyching myself up for the inevitable New Year’s resolution to exercise more and spend less time in front of the computer and more time enjoying life and learning. Sadly, wisdom is not the only thing that comes with age and, while writing about food and restaurants has its perks, it also carries a lot of weight… HA! Just in the wrong places. Now, I need the detox AND the exercise and a moratorium on the liquid libations I love so much. Ugh. But, let’s not dwell on that. Today, I’m following the yoga mantra of living in the moment and sharing the first of many delicious and nutritious, low sodium dishes that will fit in nicely with your (our) detox plan for the new year but not leave you (or me) feeling deprived. A low calorie, not-like-greasy-Chinese-takeout version of Cashew Chicken – it’s also low carb, low sodium, low fat – low everything except flavor; it’s high in rich nutty flavor from real peanut butter, wrapped in cool, fresh Boston lettuce leaves lends a satisfying crunch, and sprinkled with Kick-A$$ seeds imparts a little heat to round out the whole experience. I’ll be making this again, come January. A light and delicious low-carb, paleo friendly, gluten-free way to jump start your clean eating, weight loss goals. Slice then chop the chicken breasts into ½ inch pieces. Wash and chop the green onions and beet green leaves and stems. Heat the sunflower and sesame oil in a skillet over medium hight heat. Sauté the beet green stems for a minute. Add the leaves and green onions, cook for another 2-3 minutes until softened. Using a slotted spoon, remove the greens to a bowl and set aside. Add the chopped chicken to the pan and cook until cooked through, stirring occasionally, about 8 minutes. Transfer the chicken to a bowl and set aside. Add the peanut butter and coconut amines to the pan juices, stirring to combine. It will thicken up and brown immediately, stir in chicken broth. Stir in the chicken, beet green onion mixture, and cashews. Sprinkle with seeds. Serve immediately with lettuce leaves. *you can purchase Kick A$$ seeds at Avanti Natural or use toasted sesame seeds mixed with a cayenne or spice blend of your preference. 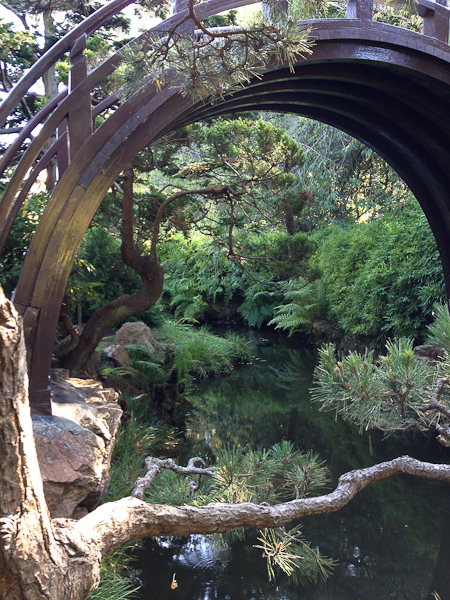 Now, how about let’s channel our inner ohm with a few enchanting photos from a recent visit with College Girl to the Japanese Tea House and Garden at Golden Gate Park in San Francisco. Although, it too is a popular tourist destination, Golden Gate Park has much to offer far in the way of respite far from the madding crowd. Meander along the peaceful curved pathways and let the peacefulness wash over you; experience an intense awakening of the senses with the sounds of an azalea-covered waterfall, the sights of regal lanterns and statues, and the intoxicating scent of sweet wisteria and other magical blooms. The Japanese Tea Garden was established in 1894 to showcase a Japanese Village for the California Midwinter International Exposition (also referred to as the World’s Fair) and is heralded as the oldest public Japanese garden in the United States. 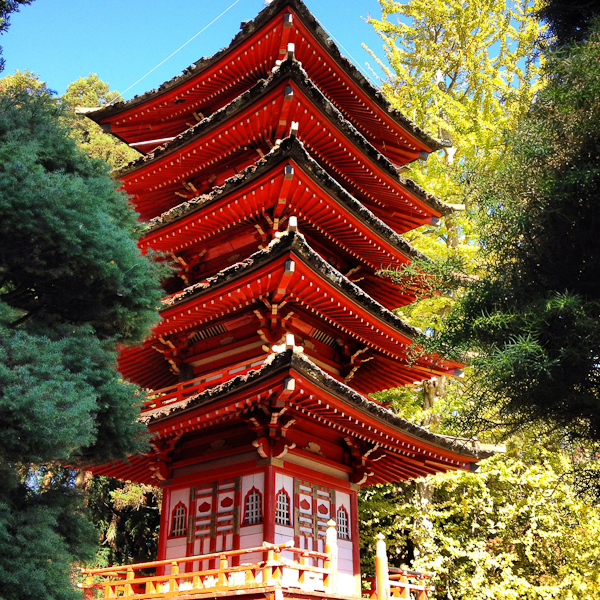 This five-story Pagoda once graced the 1915 Japanese exhibit at the Panama-Pacific Exposition. Pagodas serve as Buddhist shrines and thus hold a special place in Far East culture. The nine rings on this particular example symbolize the different heavens of the gods. Situated behind the Pagoda, the Zen Garden filled with bonsai trees and azaleas presents a mini-mountain setting, complete with stone waterfall and a river made of white gravel. We wandered into the gift shop where I bought a cute set of chopsticks and colorful wonton chopstick rests. 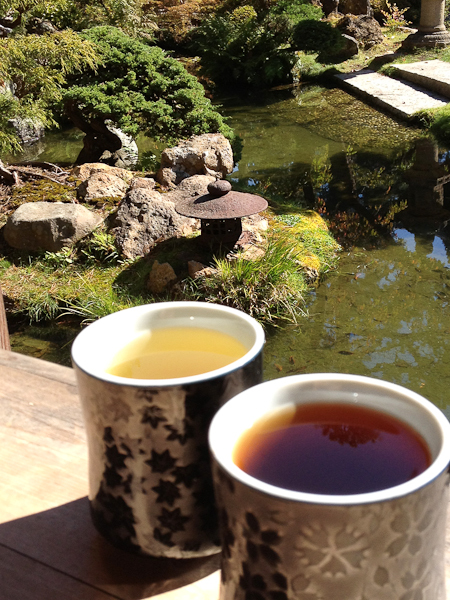 At the teahouse, we ordered tea and some nibbles and sat quietly contemplating the bonsai and bronze lanterns surrounding the pond as we sipped the delicate tea. Like the Sencha tea she ordered, my girl is light and bright: the light in our life with a bright future, even though, like many of her generation, she worries about what her future will be in this increasingly competitive and economically troubled world. Sencha is a Japanese green tea prepared by steaming its leaves and rolling them into their signature needle-like shape. It is characterized by a distinctly bright, sweet aroma and ﬂavor. This tea is steeped and served in a small teapot. I chose Hojicha which has an earthy, nutty and slightly smoky flavor. Hojicha originated in Kyoto and is distinguished from other Japanese teas because it is roasted in a porcelain pot over charcoal, whereas, others are typically steamed. My interest in tea was sparked in a large part by our travels to Hong Kong and Shanghai where I learned about the traditional tea ceremony, consulting with a Chinese herbalist, and visiting tea shops that carry all manner of ancient and modern tea implements and high quality loose leaf teas while tasting and learning about the different qualities of each. An important part of getting the maximum benefit from your tea is to choose a tea made with high-quality ingredients. If you’re making it yourself, buy your tea from a reputable tea shop and try mixing up a few of your loose-leaf herbal teas for a new taste. If you want to drink tea on the go, look for ones low in sugar, Fair Trade certified, brewed from whole tea leaves, and organic.